Although the terms floating flooring or floating floor are relatively new, the concept is far from new. A floating floor is a floor that is not attached to the sub-floor directly below it. In other words it floats on the sub-floor and hence contracts and expands independent of the sub-floor. are all attached directly to the sub-floor in some manner. In the case of hardwood, if the sub-floor is wood, the hardwood is nailed or stapled to it. If the sub-floor is concrete then the hardwood is installed using an adhesive. Ceramic, porcelain, granite or marble tiles are attached to the sub-floor using an adhesive or thin set mortar mix. Considering that a floating floor is a floor that is not attached to the sub-floor, older products such as wall-to-wall carpeting, could easily be termed a floating floor . Large and small area rugs could also fall into this category. Sheets of linoleum were attached to the sub-floor using an adhesive. Some of the newer sheet vinyl flooring materials are installed as floating floors , others require an adhesive under the entire sheet, while others require that only the edges and/or seams are held in position using a specially formulated adhesive or double sided tape. The newer flooring materials that fall under the floating floor category include laminate and engineered hardwood flooring (Figure 1). In the case of vinyl sheet flooring, that is designed to be a floating floor, the installer is dealing with one large piece of material that is trimmed to fit the area where it is being installed. It may be noted, that is more than one sheet of vinyl flooring is required, due to the span of the room, that in most cases the vinyl sheeting must be bonded to the sub-floor where the seam occurs. Laminate and engineered hardwood flooring products are pieces of material that are designed to interlock with one another. The interlocking creates one large piece of material. Some of these flooring materials use a mechanical mechanism as the locking device while others rely on an adhesive between the edges of the material. In either case the finished outcome is one continuous piece of flooring material. It should be noted that in many commercial applications laminate flooring and engineered hardwood flooring is glued to the sub-floor in order to prevent the material from shifting under high traffic conditions. In residential applications there is no reason to bond the laminate or engineered hardwood flooring to the sub-floor, with the exception of installing any of these flooring materials on stairs. 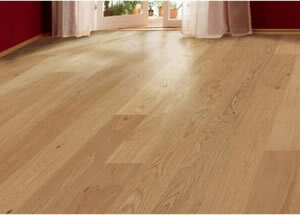 It is easier and quicker to install than a flooring material that requires some method of attachment to the sub-floor. It can hide some minor imperfections or unevenness in the sub-floor. As a thinner product, they generally can be installed on staircases without the necessity of modifying the stair treads prior to installation. Floating floors have limitations to the span of the area that they can cover, although in most residential applications room spans do not generally exceed the manufacturer’s specifications. They do not transition seamlessly from room to room or room to hallway without the need for specially fabricated transition trims or moldings. Because the flooring floats, many homeowners complain that when walking on a floating floor you hear an echo or a hollow sound, which is the noise reverberating between the finished floating flooring material and the sub-floor. It should be noted that some of the better underlayments used for floating floors reduce or eliminate the vast majority of this sound. As a general statement, floating floors require an underlayment between the floating floor and the sub-floor. Additional information about floating flooring underlayments.